Contributor used DJI Phantom 4 and Mavic Pro drones, combined with ground camera footage, to create this video of an epic helicopter ski trip to one of Europe's most famous glaciers. The Gorner Glacier runs down the west side of the Monte Rosa masif near Zermatt, Switzerland. With a surface area of nearly 60 square km (about 20 square mi. ), it's the second largest glacier in the Alps. 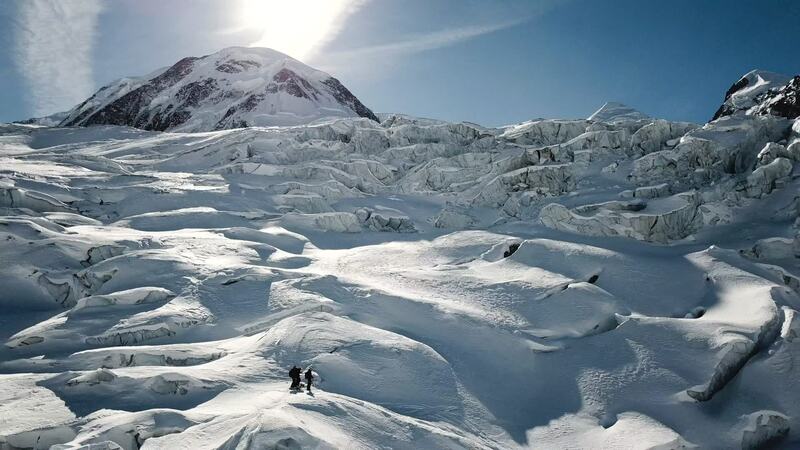 Monte Rosa, which is part of the Pennine Alps, is the second highest peak in the Alps after Mt. Blanc in France. Description: Amazing views on our descent down the Grenz and Gorner glaciers. The heli picked us up from the Italian side and dropped us at the Col du Lys 4255m (14,000ft) between Lyscamm and the Monte Rosa. From there we descended down the Grenzgletscher and Gornergletscher and arrived in Zermatt Switzerland. We then took up the Klein Matterhorn cablecar and skied off piste all the way back to Champoluc, Italy where we were staying. Overall amazing day with insane scenery despite not great snow conditions. Shot with the DJI osmo pocket, GoPro hero 4, and DJI Mavic pro.